This tiny little seed contains a wealth of vitamins and nutrients. If you're interested in eating buckwheat sprouting seeds, learn more about how they can improve your health. Whether you're on a raw diet or are just trying to eat healthier overall, buckwheat sprouts are a great way to boost your nutrient intake. 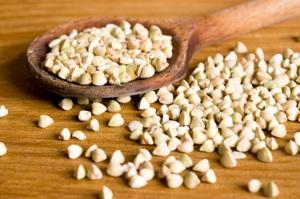 What Are Buckwheat Sprouting Seeds? While folks often think of buckwheat as a cereal grain, they're mistaken. Buckwheat seeds are actually the fruit of the buckwheat plant, and are considered a pseudocereal unrelated to wheat. In fact, buckwheat is actually related to rhubarb and sorrel. It is also known as "beech wheat," owing this name to the fact that its tiny triangular seeds closely resemble the large nuts of the beech tree. Since buckwheat is a plant seed and not a grassy grain, it bears no relationship to wheat. Buckwheat is a gluten-free food, so those who suffer celiac disease or other gluten intolerances can enjoy this little seed any way they want - sprouted, roasted, or ground into flour for baked goods. Buckwheat pancakes make an amazing breakfast treat for those who can't have regular pancake mix. This seed might be small, but it packs a major health punch. High in protein, amino acids, and a host of other vitamins, buckwheat makes a great addition to your diet. Since it is easy to digest, buckwheat is an excellent source of protein for those who follow a vegan/vegetarian diet or have a tough time digesting animal proteins. Buckwheat contains all eight essential amino acids, which makes it nearly a complete protein. Its high fiber content promotes digestive health and is a very good food for celiacs who generally avoid grains. Buckwheat is also known to keep blood pressure, cholesterol, and glucose levels in check, so if you're looking to reduce your risk of cardiovascular disease, consider adding buckwheat-related foods to your diet. Sprouts are a super healthy addition to your diet! How Do You Grow Buckwheat Sprouts? If you want to grow your own buckwheat sprouting seeds, it's actually a simple process. You'll find a variety of ways to go about growing sprouts, but for this method all you'll need is a plate and a light-colored 100% cotton washcloth! First, you'll want to soak your seeds overnight in fresh, chlorine-free water. Once they have soaked, rinse them well. Next, line a large flat-bottom plate with a clean, wet cotton washcloth (cotton only, please) and spread your seeds out flat in the middle of the plate. Fold the cloth over so that the seeds are covered. Place the plate in a bright, well-ventilated spot that is out of direct sunlight; a kitchen counter works well for this. Two or three times a day, check the cloth to make sure it is not dried out - you do not want it to become completely dry or sprouts die. If it needs it, sprinkle the cloth with a little more chlorine-free water until it is damp throughout. You do not want to soak it too much, as mold can form. After a few days, check your sprouts to see if they have grown little tails. You can eat them at any point after the soaking stage, as they are officially germinated at that point, but if you like you can allow them to keep growing until their tails have reach about half an inch. Harvest your sprouts and enjoy them in salads, sandwiches, or all by themselves. If you want to know more about buckwheat sprouting seeds, here are some great links to help you learn more about buckwheat and sprouting in general. Sprout People are a great source of information on sprouting, and can even provide you with equipment and seeds to get you started. 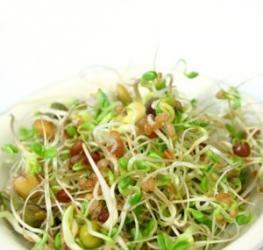 Living and Raw Foods has a great introduction to the basics of growing your own sprouts. Renegade Health has a video that shows you how to sprout your buckwheat seeds.